The data set _b now contains 3,152 observations (see Output 61.16.2 for the first few observations). The Time and Status variables are no longer needed; hence they are discarded from the data set. The int_index variable is an index variable that indicates interval membership of each observation. 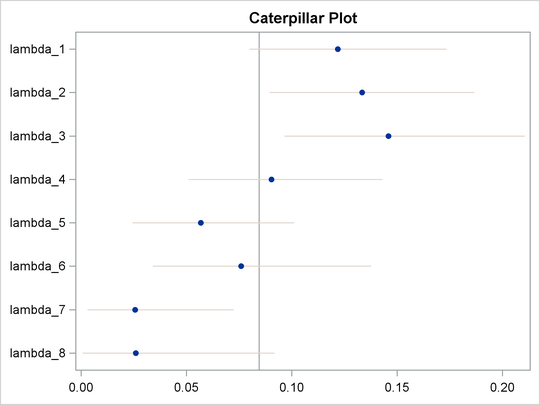 Output 61.16.3 displays posterior estimates of the three regression parameters. To understand the results, you can create a table (Table 61.50) and plug in the posterior mean estimates to the regression model. A –0.41 estimate for subjects who received laser treatment and had juvenile diabetes suggests that the laser treatment is effective in delaying blindness. And the effect is much more pronounced (–0.80) for adult subjects who have diabetes and received treatment.